This week we can deny the truth no longer. If there is something you have been wrestling with try to address these feelings. Usually the aces arrive when we are in the face of a pure ideal. In this case, the ace of swords is a symbol of the purity of thought. It helps us see things as they are, hence the hawk in the background. 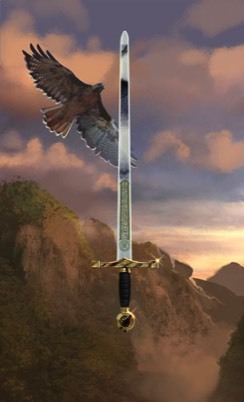 The Hawk is known as the visionary and is the steward to the truth the sword wields in our direction. So wake now, my friends, and make your decision. Know, too, that it is likely one you will not be able to go back on so tell the truth to yourself or anyone else who may be waiting to hear it.